Nonprofit Board And Internal Working Environments—No Pieces of Cake! People who work in the business community sometimes view nonprofit organizations as “cushy” places to work. The truth is that today’s nonprofits have challenges that are very different from those of the corporate world–and typically struggle to accommodate parameters such as restricted finances, increasing wage costs that must aligned with ever expanding client needs. In addition, board members must be concerned about personal liabilities under special legislations such as completing the IRS Form 990 and The Intermediate Sanctions Act. * Not easy! A recent article in the Wall Street Journal discusses the hypothetical release from “grind” pressures a business executive might experience when moving employment to a nonprofit. ** Following are some of the specific advantages cited by the article (in bold) followed, by some of my real world observations. No question about this statement when it comes to measuring objectives that are anecdotal, subjective, interpretative or qualitative, such advocacy for the homeless. ** Also the metrics can only rely on small sample data or those that are derived from situational data. On the positive side, both nonprofits and for-profits are beginning to utilize types of data often referred to as “non-financial metrics.” These are lean experiment style metrics *** that can be modified, long as as learning takes place. Nonprofit boards often employ a process culture because they are responsible for public funds or charitable dollars. This often leads to a board micromanagement approach long after the nonprofit has exited its startup phase. Also it causes many nonprofits to limit their potential for maximizing client service. “There are also multiple stakeholders (clients, donors, volunteers, the general public) whose viewpoints have to be considered. 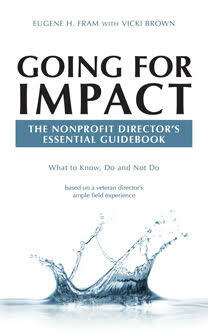 Both business and nonprofit organization have multiple cohorts with which they must be concerned in the 21st century. But the nonprofit has to tread the very fine line between various constituencies. A board member angering a large donor can lead to the organization’s bankruptcy! Nonprofit managers have to devote significant time to garner a high level of collaboration, some times at the expense of more important projects. Some boards provide them themselves o operating on a “consensus” format. But without directors’ financial investments in the organization, and a rotating director tenure system (4 to 6 year median), votes can be based on a personal need to “go along to get along.” What should take place is rigorous and civil discussion, respectful of dissenting votes. Enough comparisons have been made to differentiate nonprofits from for profits. I see increased convergence between the two sectors to demonstrate that nonprofits should be taken no less seriously than businessess do. Nonprofits have a triple bottom line to meet, people, planet, and “profit” compared with their business counterparts.